The European Commission is looking forward to advancing “the strong and broad EU-India partnership across all areas of our bilateral and multilateral agenda,” an EU spokesperson told EURACTIV after the Indian elections began on Thursday (11 April). However, for the EU to align itself with a country dogged by religious conflicts and severe caste divisions is a potentially perilous move. In 1776, when British philologist Sir William Jones translated the 3,000-year-old Manusmṛti, the most authoritative text on Hindu law, he could not have predicted the influence the book’s foundation of caste divisions would have on Indian society to this day. Despite repeated government reform, India’s hierarchical social structure still penetrates into the heart of popular opinion. It is a five-stratum system. At the top are the Brahmins, mostly a contingency of priests and professors. Then, the Kshatriyas, historically, those in this category were warriors and rulers. Thirdly sit the Vaishyas, representing those working in trade. Fourthly are the Shudras, the manual workers. Since Independent India’s constitution in 1950 banned discrimination based on caste grounds, social mobility for those at the bottom of the ladder has improved, but the country has a long way to go. Figures from the World Bank in 2018 show that only 8% of Indians whose parents were in the lower ranks of educational attainment were able to rise to the top quarter of earners. However, divisions in the country are not only along social lines. Fifteen percent of India’s population are Muslims, and Prime Minister Narendra Modi’s Hindu-nationalist ideology has done little to placate the growing their sense of alienation. Since the governing Bharatiya Janata Party took office in 2014. Modi has pursued overtly pro-Hindu policies – such as the emphasis on prioritising the teaching of the Hindu religion in schools – as well as disputes over the ownership of holy sites. Lynch mobbings and beatings of Muslims are today commonplace. There has also been a gradual rise in violent crime against Muslim minorities, following reports that Hindu vigilante groups have killed tens of Muslims and Indians of lower social ranks, who they accuse of harming cows, a sacred animal in Hindu culture. The opposition is the more moderate Indian National Congress, led by Rahul Gandhi. They were in power for most of India’s post-independence history and Ghandi is most likely to secure the majority of the Muslim vote. Most polls predict that Modi’s Hindu-nationalism to reign supreme after the elections, which are being conducted over a six-week period. With a voting population of around 900 million, the process takes time. On Friday, Modi was awarded Russia’s highest honour, the Order of St Andrew the Apostle, for “exceptional services in promoting the special and privileged strategic partnership between” according to the Russian Embassy in India. 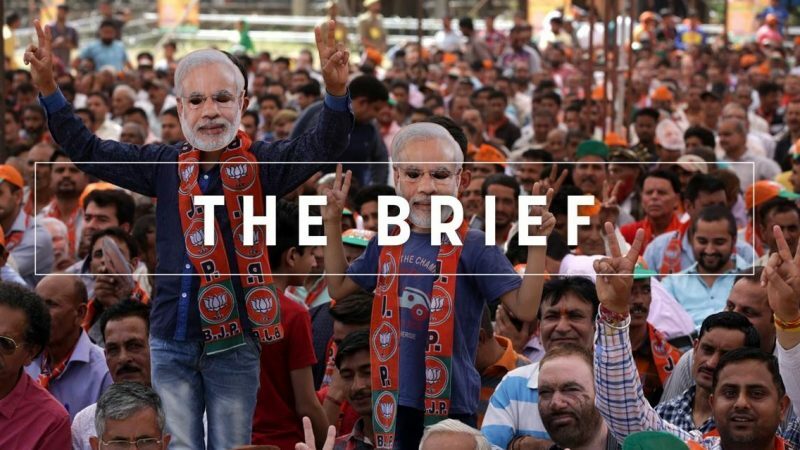 India’s election, the biggest in the world, will chart the trajectory of a country already heralded as a future economic global powerhouse. But the EU must again consider that which distinguishes it from other political institutions worldwide: a principled commitment to the rule of law and a passionate defence of minorities. The outnumbered in India would no doubt appreciate the conscientiousness of Europeans in this regard. Orderrrr! John Bercow, speaker of the House of Commons, says the UK does not face a constitutional crisis but rather a political challenge when it comes to tackling the Brexit deadlock. The EU is considering slapping more than €19 billion in fresh tariffs against the US in response to subsidies provided to planemaker Boeing, EU and European officials have told EURACTIV. Back in Brexit-land, Nigel Farage formally launched his Brexit party, promising to save Brexit for a British public that had been “betrayed” by its political leaders. Bioeconomy could be a model for the future of agriculture. But the question is – what kind of bioeconomy do we need? EURACTIV Germany explains. Member states are likely to miss a deadline for implementing a track and trace system for tackling illicit tobacco trade, which risks creating disruptions in the single market. Finland’s EU presidency and MEPs in the new European Parliament will have to address all relevant health concerns when it comes to the drinking water rules if they want to pass the historic first citizen-led EU legislation in the next term. Jan Zahradil, the Spitzenkandidat for European Conservatives and Reformists, lays out ECR’s vision for the future of Europe, as well as possible collaborations with Salvini and Orban, in our latest Over a Coffee video. Speaking of video, check out this week’s edition of the Tweets of the Week. Last plenary session of the current European Parliament.